In advance of Earth Day, Vermont’s largest electric utility, Green Mountain Power announced its commitment to achieve 100% renewable electricity within the next 11 years. GMP’s announcement follows plans and proposals in dozens of other jurisdictions including Washington, D.C., Puerto Rico, Hawaii, Massachusetts, California, Iceland, Sweden, Costa Rica, and Scotland to achieve 100% renewable electricity. “It’s time to REV-up action to grow our local economy and protect our communities from climate change. 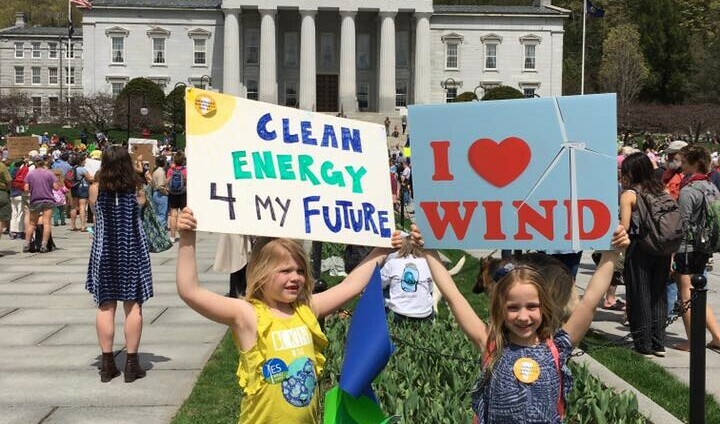 Vermonters, local businesses, towns and GMP are working together and moving ahead with local renewable energy and resiliency projects, we simply can’t wait for political delays,” emphasized Olivia Campbell Andersen, Renewable Energy Vermont’s executive director. Vermont’s current Renewable Energy Standard law requires just 10% of electricity to come from in-state, small, renewable projects. Recent changes and delays by the Public Utility Commission to net metering, the tool that allows Vermonters to generate their own local renewable electricity, have made it too difficult for innovations like parking lot solar canopies and shared community solar projects to be viable. H. 366, sponsored by Reps. Mary Sullivan and Mike Yantachka, streamlines permitting for parking lot solar canopies on existing or permitted parking areas. Codifies preferred renewable generation locations with some enhancements – notably enabling residential community solar to be a preferred site so that it is once again viable in Vermont, and enabling parking lot canopies on both paved and impervious engineered (gravel +) parking lots. The bill also requires deadlines for the Public Utility Commission’s review of permits. Currently more than 40% of community solar projects proposed last year waited more than 6 months for a permit, and some are still waiting over more than a year later. H. 337 sponsored by Rep. Robin Chestnut-Tangerman, prohibits subsidy and qualification of fossil fuel projects as energy transformation under Tier III of the Renewable Energy Standard (RES). The legislation would also prohibit non-renewable electricity purchases, such as nuclear, from eligibility under the RES, so that a utility may not lower its compliance requirements to help Vermont’s move away from fossil fuels with renewably powered heat pumps, electric vehicles, advanced wood heating, or energy efficiency. Earlier this year REV and several other organizations wrote a letter urging the Public Utility Commission to reform its implementation of the RES.